Yesterday, I played Orcs Must Die! Unchained (OMDU) nearly 12 hours straight. At first, I thought this was because I had intentionally dungeoned myself to crank out a review, but the more I played, grinding to nab just a few more skulls to upgrade this trap and that trap, I realized the opposite — OMDU had caught me in its upgrade-obsessive, orc-slaying trap. And despite the bevy of other 2017 hits already sitting unplayed in my games library, I’m okay with my addiction, because OMDU is a delightful free-to-play game that deserves your attention. The War Mage is back, baby. The third entry in developer Robot Entertainment’s action/tower-defense hybrid launched last week after more than two years in open beta. 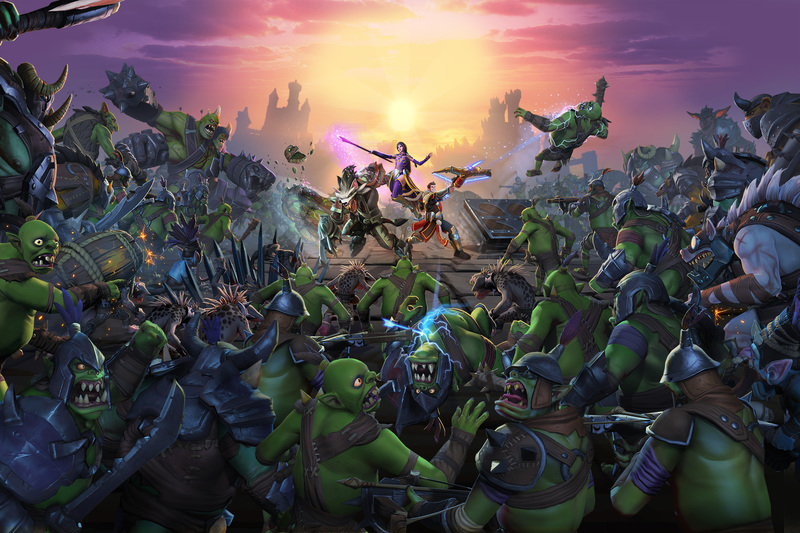 In it, you and two friends choose from a roster of cartoony heroes to place traps and combat waves of nasty orcs in a variety of worlds that pop with personality. There are 17 characters to choose from, and each requires players to think in slightly different ways. Learning each hero’s nuances is one of the main gameplay hooks, like how to do the most damage when playing as the cocky charming Maximilian, or how to effectively pummel enemies with Tundra the polar bear warrior’s snowball roll. Only three characters are available when you start, but you can purchase more outright via microtransactions, or spend skulls, in-game currency you’re rewarded with at the end of each match, to unlock them. The game’s free-to-play elements never feel abusive, though. You can easily earn the skulls you need to upgrade your traps and unlock new characters in just a few hours of play. I never found myself overwhelmed by the cost of different items or felt that “buying in” was the only way to play the game successfully. In fact, the only items in the game that cannot be purchased with skulls are vanity items, and appreciably, these don’t impact the gameplay whatsoever. Spending your real world money will expedite the process of upgrading your traps from simple contraptions to death-delivering booby traps, allowing you to steamroll enemies in earlier levels, but earning these gradually as you invest more time in the game always leaves you something to look forward to. Whether you drop some cash into the game or not, OMDU is a complete package from the onset. If you want to unlock every hero in the game at the start, you can buy a special package in the in-game store for $29.99 USD. Clever players can combine traps to create impressive Rube Goldberg machines. If you’re like me, though, you’ll be content to simply flip enemies off the map. These cards are randomly generated though, and with very little time between waves to chat with your team and the lack of an in-game public voice chat feature, a lot of Sabotage feels out of the player’s control. This is in stark contrast to Battlegrounds where success is determined by how well you use your heroes’ abilities, place traps and coordinate with your team. When opponents activate their own cards against you, it doesn’t matter how well you’re playing — it’s anyone’s game. Luck of the draw. Sabotage isn’t unwelcome in OMDU, but it’s disappointing that it doesn’t capitalize on what makes Battlegrounds so successful. Criticisms aside, it needs saying that OMDU’s lengthy stay in open beta shows — the game is impressively polished. Whether playing solo or with friends, matches don’t take long to load, menus are clear, and the user interface is easy to navigate. The game did draw me out a few times when heroes spewed the same witty one-liners, but this is a minor complaint in lieu of the game’s consistently slick performance. Free-to-play games often carry the stigma of being “pay-to-win” — a design philosophy that says if you want to win, buy in. Orcs Must Die! Unchained isn’t that. It’s a hoopla of co-op action that works whether or not you want to drop some dough. While the new Sabotage mode is a welcome, albeit lesser refined addition to the series, it’s in Battlegrounds that Robot Entertainment flexes its action gameplay muscles and it's the game type that will keep me coming back for dozens more hours — or at the very least, to nab those daily login bonuses.